This GS Caltex petrol station is located at Junggu Toegyero near Chungmuro Subway Station. Foreign tourists mostly don't drive in Seoul because the public transportation system is really excellent. So, this post is not related with filling of petrol for vehicle. Actually I write this article is due to the strategic location of the GS Caltex petrol station. The GS Caltex is at the opposite of the mini restaurant which I had mentioned before. 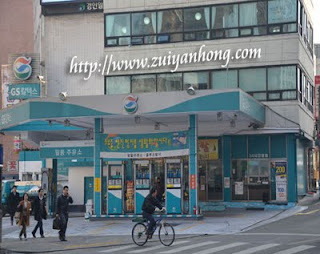 Beside that the GS Caltex petrol station is just outside the main entrance of Namsangol Hanok Village. In case you want to visit Namsangol Hanok Village, the GS Caltex petrol station can be a landmark for you to get there.